Receiving the award for Healthcare Department Initiative in a Large/Teaching Hospital were members of the Robotic Surgery Team at UL Hospitals. The efforts of staff at UL Hospitals Group has been recognised at this year’s Irish Healthcare Centre Awards. UHL received the award for best Healthcare Department Initiative in Emergency Care for the Development and Implementation of an ED Nursing Proforma for Post Triage Assessment of Adult Patients. And UL Hospitals Group won the award for Healthcare Department Initiative in a Large/Teaching Hospital for the Implementation of a Robotic-Assisted Surgery Program. The award for the Initiative in Emergency Care arises from research conducted by Sarah Watkins, an ED nurse at UHL and PhD candidate at the University of Limerick, on the journey of older patients in the ED and the contribution of nurses in acute services. The ongoing project has seen the introduction of more evidence-based and standardised nursing documentation in the ED, promoting more comprehensive patient assessment and safety. In 2016, UHL became the first hospital in Ireland to perform colorectal, renal and adrenal surgical procedures using the state of the art Da Vinci Xi Dual Console robot. Further subspecialties and surgeons will be joining the robotic program as the year progresses. The first ever live stream of robotic surgery in Ireland was carried out at UHL in November 2016 and earlier this month, UHL hosted the inaugural Irish training course on robotic surgery. In addition to the winners, a number of other clinical teams and projects at UL Hospitals were shortlisted in this year’s awards. “We were delighted to get so many nominations and doubly so to see two of our teams get this well-deserved national recognition. “At a time when it has become fashionable to say the health service has run out of ideas, it is great to see two initiatives that have grown out of the MidWest – and which are already delivering for our patients – recognised at a national level,” said Ms Cowan. A “STATE-of-the-art” surgical robot has been launched at University Hospital Limerick, making it one of the most medically-advanced cancer treatment facilities in Ireland. 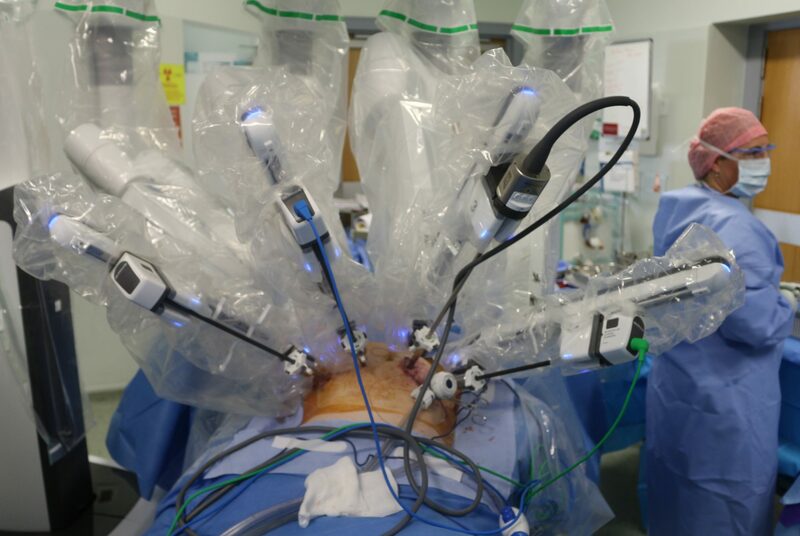 The Da Vinci Xi Dual Console Robot, the details of which were first revealed by the Limerick Leader this September, is the first of its kind in a public hospital in Ireland, valued at €2.6m. Donated by the Midwestern Hospitals Development Trust, and funded by the JP McManus Benevolent Fund, the robot is able to perform remote-controlled laparoscopic — or keyhole — colorectal, renal and adrenal surgeries. The pioneering surgeons behind the project are Prof Calvin Coffey, colorectal surgeon, Subhasis Giri, urologist surgeon, and Limerickman Dr Colin Pierce, colorectal surgeon, has recently joined the robotic surgery team. A spokesperson for the UL Hospitals Group said that this type of surgery is the “highest international standard of surgery worldwide” and is the most advanced type of surgery. Leading the team, Prof Coffey, foundation chair of surgery at UL’s Graduate Entry Medical School, said that, hitherto, this type of surgery has been part of the private healthcare sector. So far, there have been 29 cases at UHL with “hugely encouraging results and a high level of patient satisfaction”, Prof Coffey added. Junior doctors, nurses and students, who wish to learn more about how robotic surgery is done, will soon be able to witness it in action via live broadcast. This project has received €135,000 in funding from the hospital’s academic partner, University of Limerick. Launching the project this Tuesday, UL Hospitals Group chief executive Colette Cowan said that the robotic surgery can provide “significant cost savings”. Live Stream from UL Gems Surgery on Vimeo. UL Hospitals board chairperson, Prof Niall O’Higgins said that the robot deserves “widespread attention and celebration”. UL med students meet daVinci from UL Gems Surgery on Vimeo.